Over the years we saw all sorts of great tools from Microsoft. Many of these tools have a big number of users and fans worldwide, but unfortunately some of these tools had to be discontinued. 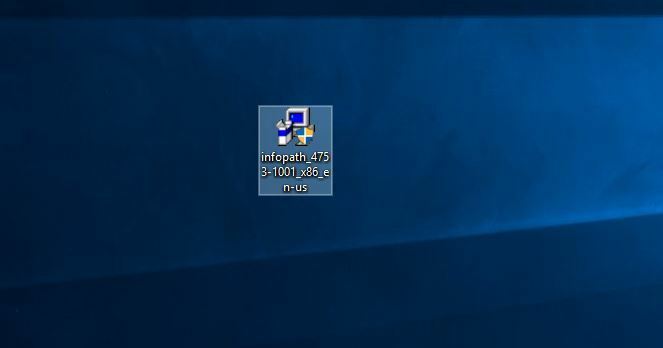 One of these tools is Microsoft InfoPath, and today we’re going to show you how to install it on Windows 10. 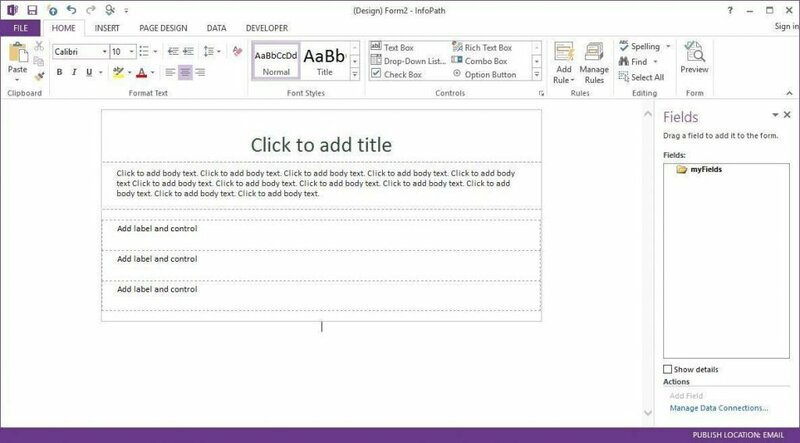 Microsoft InfoPath is a software designed for creating and filling electronic forms without writing code, in a cost-effective way. This application comes “with what you see is what you get” form designer. It allows you to quickly add input fields, text boxes, buttons and other elements. The tool is especially designed for developers and advanced business users. InfoPath can create composite applications and workflow sequences. InfoPath was first introduced as a part of Microsoft Office 2003. In January 2014 Microsoft announced its plans to discontinue this application. 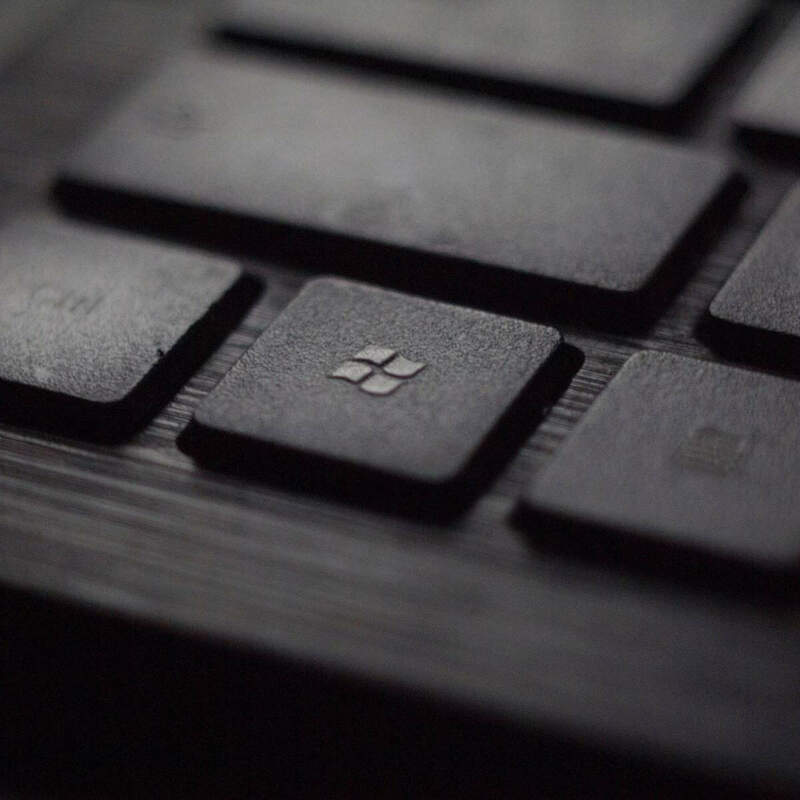 According to Microsoft, InfoPath will be replaced by a new more cross-platform solution. 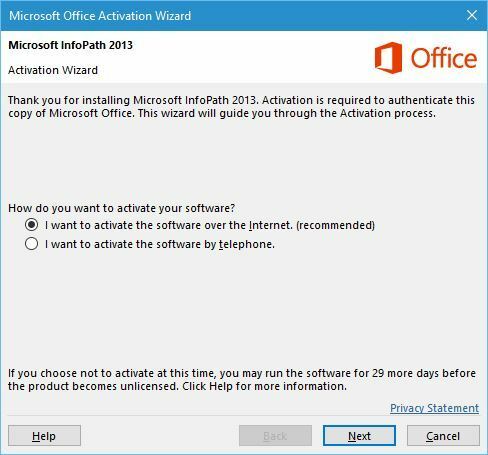 However, Microsoft still offers support for InfoPath and it will continue to support it until April 2023. Also, it’s worth mentioning that InfoPath 2013 is available as a standalone application for download. Therefore, we decided to download it and give it a try. 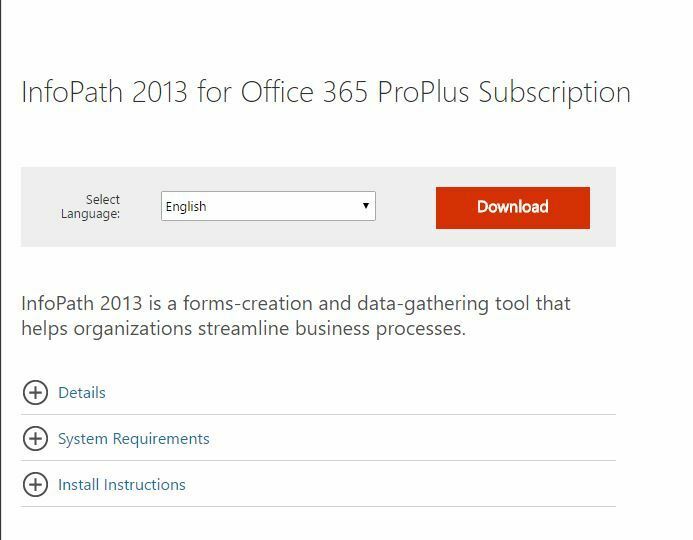 Bear in mind that this version of InfoPath requires ProPlus Office365 subscription. 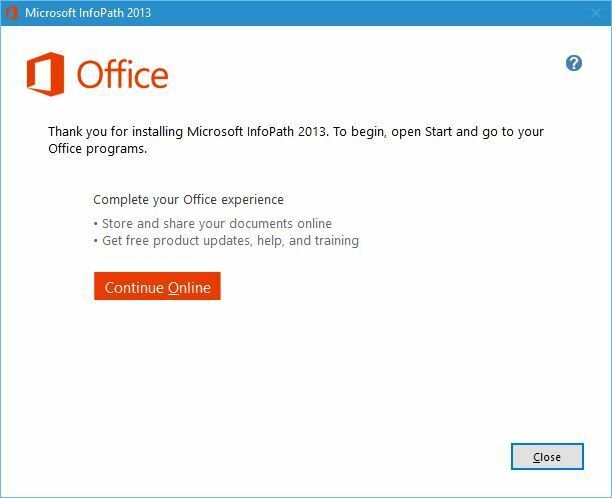 Regarding the compatibility, InfoPath 2013 is fully compatible with Office 2016. InfoPath is usually used by companies to collect data and to store it on a local computer or on a web server hosted on SharePoint. In order to fill InfoPath form, the user needs to have InfoPath Filler or InfoPath Designer. 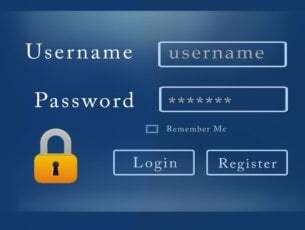 Still, users can also fill the forms by using a web browser. This method doesn’t require that users install InfoPath. However, InfoPath file should be uploaded to a server that runs InfoPath Form Services. 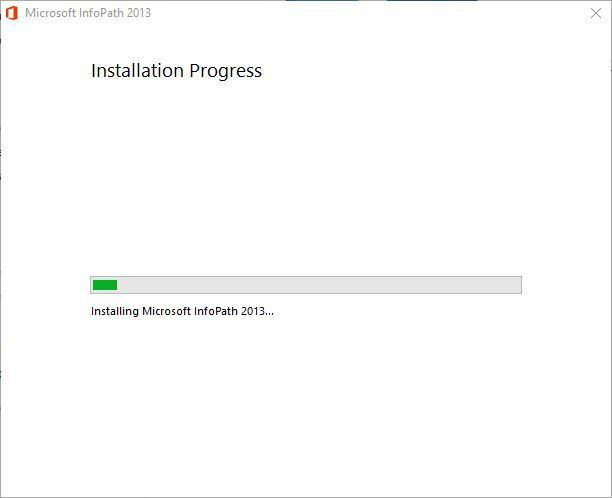 How to install Microsoft InfoPath on Windows 10? 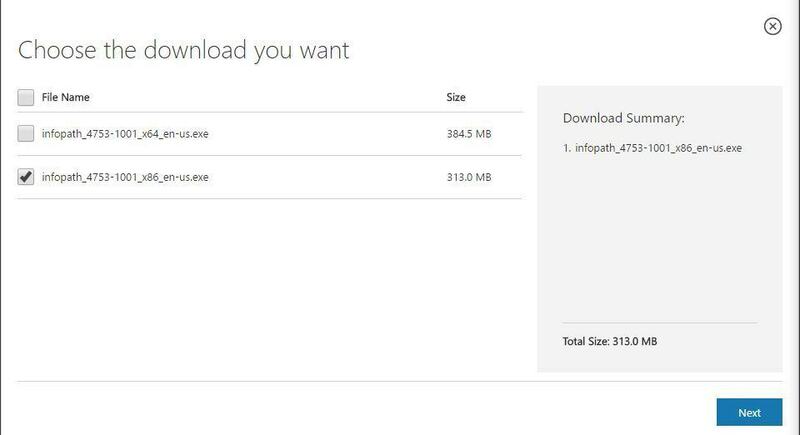 Go to Microsoft InfoPath download page. Check the version you want to download. If you have a 64-bit version of Windows we advise that you download the 64-bit version of InfoPath. Once you select the version you want click the Next button. Wait for the InfoPath to download. When the download is completed, locate the setup file and double click it. 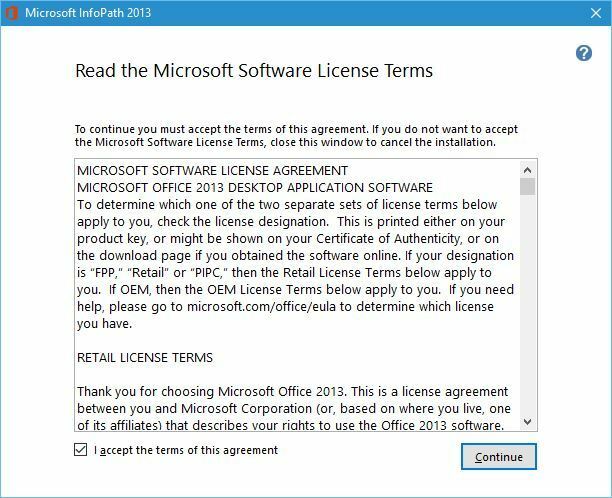 Read the license agreement, check the I accept the terms of this agreement and click Continue. Now you can choose between express installation and customized installation. 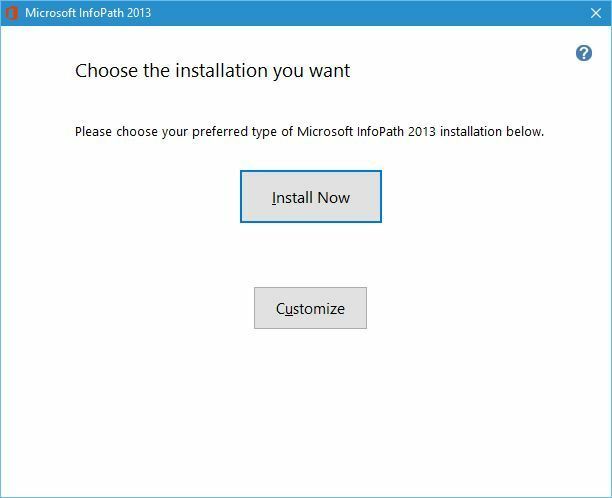 If you want to install Microsoft InfoPath to a different directory or choose what components you want to install, click the Customize button. If you want to install the software to the default directory click the Install Now button. Wait until Microsoft InfoPath installs. Once the setup is completed, click the Close button. 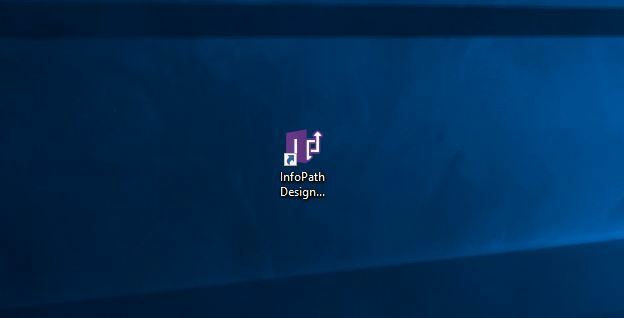 Double click the InfoPath Designer 2013 shortcut. 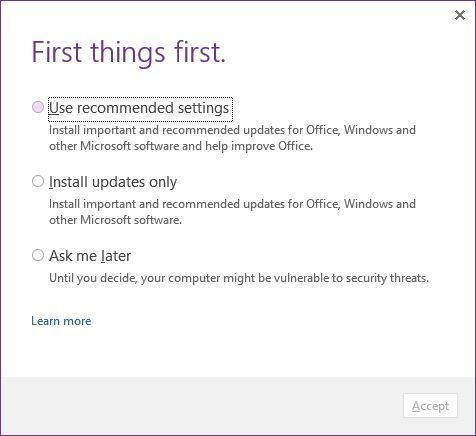 You’ll be asked to install the updates for Office and other Microsoft software. Choose any of these options and click Accept. Now you’ll be offered to register InfoPath 2013. This program is available as a free trial for 30 days. If you want to use a full version you need to activate it online. After activation InfoPath Designer should start. 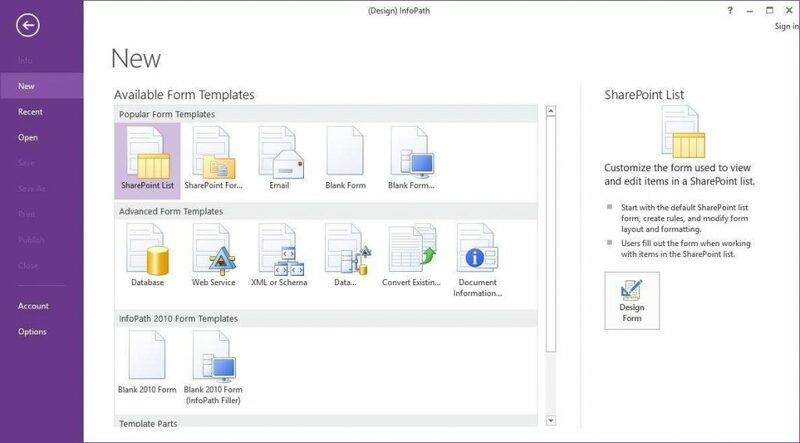 You’ll have the option to choose from several available templates. After choosing the template, you’ll be able to customize it anyway you want. Microsoft InfoPath works great with Windows 10. However, keep in mind that this isn’t a free software. Therefore, be sure to activate it as soon as you can. 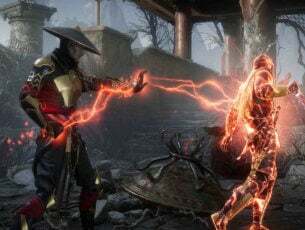 Editor’s Note: This post was originally published in July 2016 and has been since updated for freshness, and accuracy.